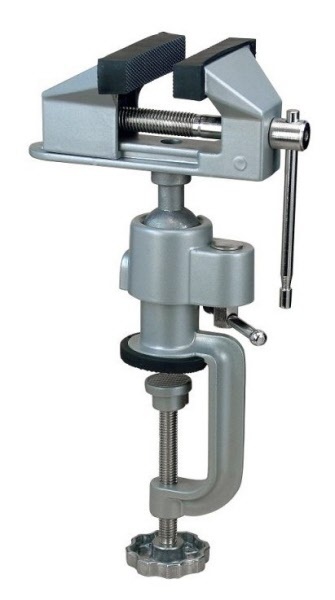 The PVC7008 Multi-Angled Bench Vice is made from die-cast aluminium and nickel plated steel. The rotating and tilting head allows you to manoeuvre your work piece to the most accessible angle and then lock into position by a single lever. The rubber grips on the jaws are for holding more delicate objects, although these. The jaws also have vertical and horizontal V-Grooves ideal for holding rods, wire or circular objects. The Vice fixes onto benches up to 55mm in thickness, with the adjustable lower clamp grip allowing for uneven surfaces and the soft upper grip protecting the surface from damage.